Oh my goodness! We are so thrilled to share Kat & Zane's amazing wedding day at the Postcard Inn!! These two are absolutely gaga for each other and their wedding day was nothing short of spectacular. Kathleen was breathtaking in her SUPER unique and incredible Vera Wang wedding gown. She had the perfect flower crown and blue wedges to go with it but our favorite detail was the diamond necklace belonging to her late sister. Make sure you follow along to the end of the post to learn more about the amazing gesture Kathleen offered the very next morning. Zane was her perfect match in his blue 3 piece suit and old school blue Dockers. They both rocked up to the first look with cans of Modelo! But their fun and care free attitudes could never conceal the deep passionate love they have for each other :) Gahhhh! They had a bright and cheerful beach side ceremony complete with heartfelt personal vows that made everyone laugh and cry. They even had their fur babies present! The best part was the beach ball recessional though! SO MUCH FUN!! The other beach goers were also very excited about their union and so many people stopped to congratulate them, some even kept us entertained with silly antics from the other side of the bar, yup the window made them look naked! Hehehehh. To kick off one of the most amazing receptions ever these newlyweds floored everyone with a choreographed dance that would make Patrick Swayze proud! WOW! Spins, twirls, lifts, ermehgerd! The partying went on all night with the incredible Matt Winter band! And hat checkered dance floor, perfection. Congratulations to the new Mr. & Mrs.! Did you notice Kat's beautiful and intricate braid.....well she cut it off on Sunday morning, keep reading to find out why. Kat is a woman after my own heart. 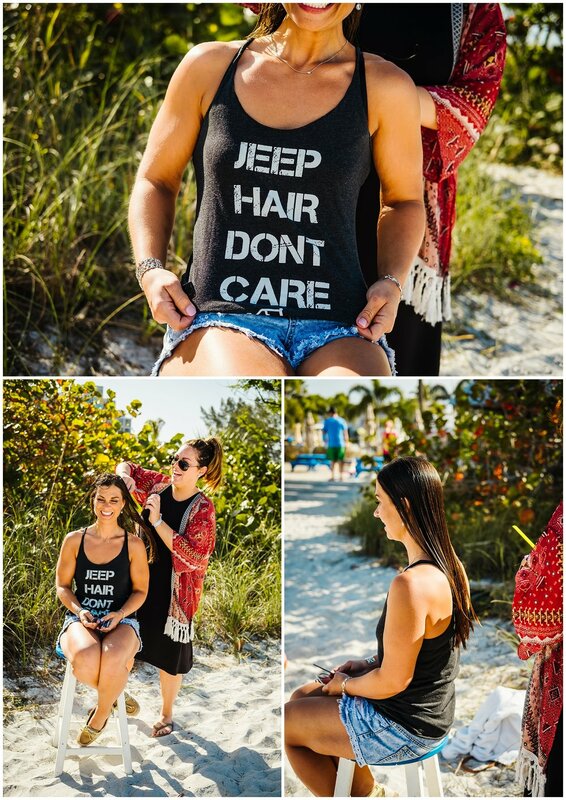 The morning after her wedding her good friend and hair stylist cut off a foot of her hair to donate to locks of love! I too have donated but Kat's motivation hit much closer to home. She lost her sister to cancer and she regularly donates in her honor. It was so special to be there for this. She had a stool, Zane's beard trimmers, and the wide open beach...magic! She even got to spend it with her sister's best friend at her side. Being a witness to such love and compassion is the best part of my job. Thank you Kathleen for trusting me with the honor of capturing your memories. Love you girl.